A significant urban extension west of Leicester, within Blaby District, New Lubbesthorpe will generate 4,250 new homes together with a secondary and two primary schools, a district centre, two local centres and a gateway employment area as well as a further strategic employment site. Around half of the 400ha site will be dedicated as green space taking the form of extensive new parklands, encompassing the Lubbesthorpe Deserted Medieval Village (a Scheduled Monument) and Lubbesthorpe Brook, as well as new informal and formal public open space, including new sports fields. New road infrastructure includes two new bridges crossing both the M1 and M69 motorways to connect the development with Leicester to the east of the M1 and to provide a link between the new housing and the strategic employment site located south of the M69. FPCR have provided landscape, ecology and arboricultural services and co-ordinated the Environmental Impact Assessment (EIA) work. 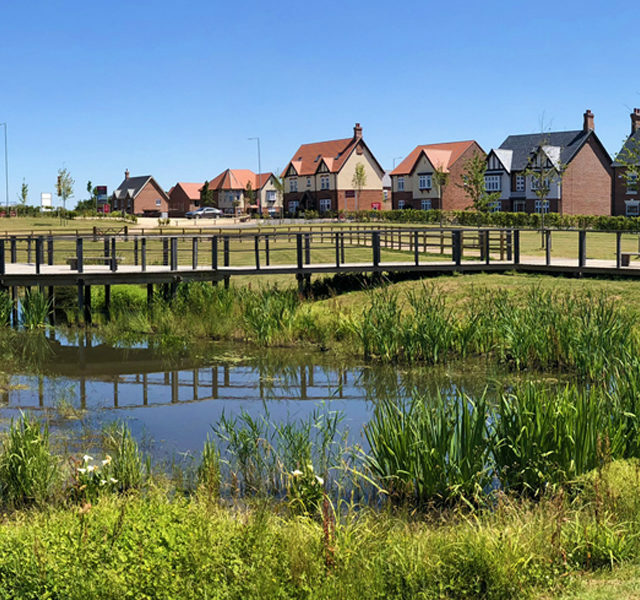 The Practice also produced the Green Infrastructure and Biodiversity Framework and Management Plan and the Arboricultural Assessment, along with the Landscape and Visual Impact Assessment, Ecological Assessment and Waste Assessment for the Environmental Statement. Following outline approval, FPCR were appointed by ERB Drummond Estate to prepare the Green Infrastructure package for the first phase of development and detailed landscape design for Reserved Matters Applications including part of the community parks network and green links together with significant structural landscape planting.